by Shahid Khan How would you feel if you had to run for your life in the middle of a night with your children because your community, house and your lives are under attack? The similar tragedy transpired in a small Christian village of Korian on 31 July, 2009 when the whole village was attacked by more than 500 Muslim extremists under the rumours that pages of Quran were burnt in a Christian wedding during the fire work display. The rumour ignited the religious feelings of Muslim who decided to unleash their fury against Christians of Korian. The attack was done by an angry Muslim mob after an announcement was made from the neighbouring mosque to “Kill the infidels and plunder the village”. Muslims used chemical bombs which moulded the metals and flattened the houses in no time. Some 60 Christian houses were burnt during the attack. Three Churches set on fire; desecrated and holy books were eaten by flames. The next day, on 1st of August, 2009 some more tragedy awaited for Christians in the village of Gojra where some eight Christian’s members were burnt alive including four women and a seven-year old child and more than 20 injured after more than 3,000 angry Muslims attacked the Christian village, torching around 50 houses and killing Christians. The attack was carried out by Sipha-e-Sahaba, a militant Sunni group on religious allegations. Hell broke out for the poor residents of Gojra and Korian, the small Christian villages in Faisalabad District, in Punjab Province of Pakistan. I visited the Korian village back in 2009 few days after the tragedy happened. The trauma of the villagers who were forced to leave their homes in the middle of night was writ large on their faces. They were driven out of their homes for miles into neighbouring villages and some even left their homes deserted to other cities. I saw the calamity which fell on the poor villagers who were mostly farm-hand, peddlers, and poor labourers. In the due course of the time, the torched houses of Christians which were blackened due to the chemical bomb in the whole village were left deserted while Christians were living on an open graveyard. Some of the villagers managed to find make shift tents provided by the local Churches and organizations who rushed to help Christians while some of the families whom I met at the time, were still waiting for such help. I met children who were playing nearby ground oblivious of the situation which changed the whole landscape of their homes and villages. I was touched to see some women who had their babies put on the ground since they did not have any other place to lay their them. I stayed for three days and met with villagers and shared time some time with them. Most of the men who were victims of the tragedy bemoaned the blasphemy laws which are playing with the lives of minorities. I met with Bashi Masih, a resident of Korian village, who told me while recalling the incident of July 30, 2009. “It was an awful night; they (Attackers) were carrying clubs, iron rods and weapons”. 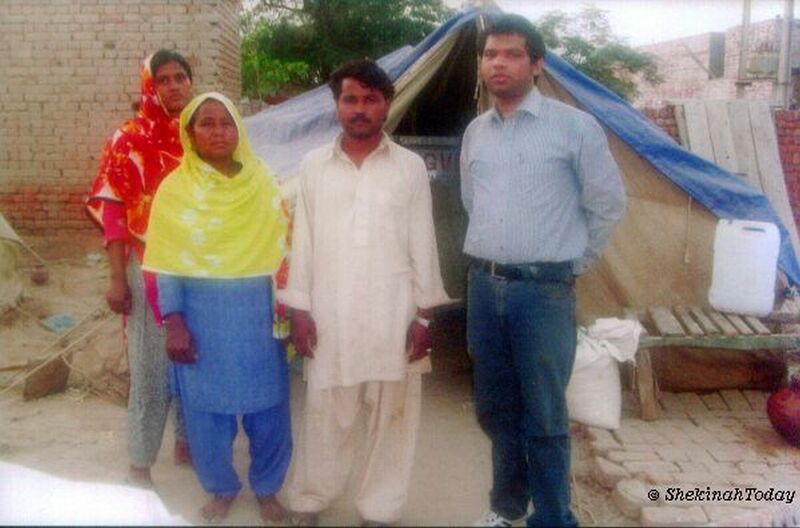 Bashir Masih, who is father to seven children, further commented on the plight of Christians in Pakistan he said “We are slaves to Muslims since we do not have any means and resources while Muslims are well. The whole village was in disarray while I could see the scenes and traces of violence in the eyes of poor villagers as well as in front of me the scenes of houses burnt to ashes. Some residents of the village were reluctant and terrified even to speak with me about the traumatic experiences which changed their lives in the matter of few hours on the basis of a rumour. At the time when I visited Korian back in 2009, the village defaced and disfigured by the waves of those acts of violence and extremism was yelling at the injustice and the vulnerability of the minorities in Pakistan. Some of the village men told me that their lives will never be same. Before the tragic incidents there was peace and love among the neighbouring villagers but now after this event we will always face the stigma of a “blasphemer”. When asked how the tragic incident has changed their lives, I was told by Younis Masih, a father of three children “ I cannot send my schools to children due to the fears of the reaction from the Muslim classmates of my children who will ridicule them . I asked them to stay in homes until things are settled.” Playing at the back of the tent, the children of Younish Maish were clueless of the trails their parents have been going through at the time. They were rather busy fighting as who will play in the mud ground outside the tent. Christian mums who had their babies clung to their hearts, were terrified at the recent untoward events which hit their lives. Torn and tearful, they told me the tale of their misery. Nasreen Bibi a resident of Korian told me “They (Muslims) stole everything from my home. They took our cattle’s and left nothing.” When asked how we can help her she maintained “Our lives are upside down and we are no help, we would like to go back to our home and feed our children”. Speaking about her long term plans, she said that she would like to start a sewing center in Korian, where she can help other women stand up on their feet and help to earn the bread and butter for their families. “I cannot think of going back and work for our Muslim masters, who hit our homes”. I would rather love to start that can help me sustain a living” said Nasreen Bibi. The cluster of tents in the middle of graveyard was a sorry picture of the helplessness of the law enforcement agencies. At the time of my stay, no government officials had managed to visit them. People who traced their steps back were unwilling to go back to their torched houses for the fear that they might be attacked again if they will go back. In the meanwhile, the Government of Pakistan intervened later and helped re- build the homes of Christian people and disturbed financial aid and relief to the victims of the families. 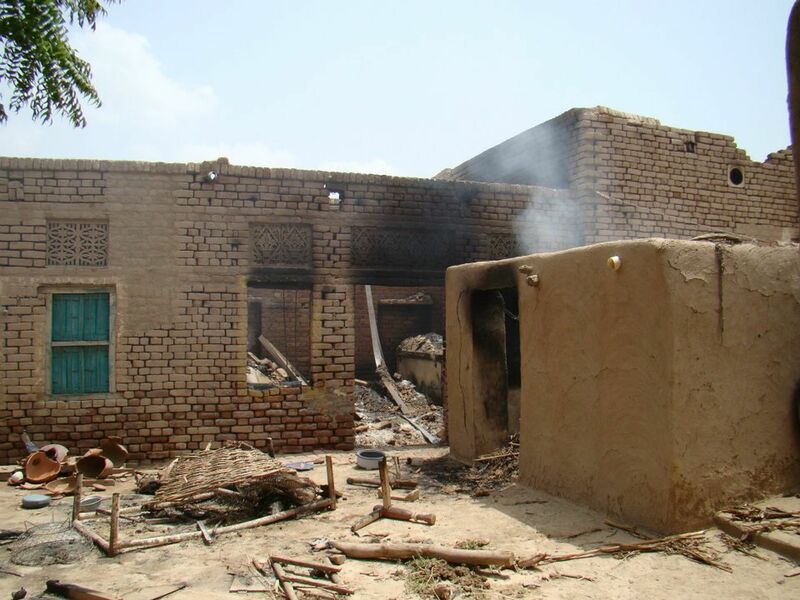 It has been almost four years now since this religious violence broke out in Gorja and Korain, Christian villages of Pakistan which caught an International attention. The Irony of the matter is, those who played havoc with the lives of hundreds of poor members of minorities in Gojra and Korian were never brought to Justice. Muslims still terrorize the minorities in Pakistan looking and lurking for another Gojra and Korian under the pretext of allegations of “Blasphemy”. The minorities in Pakistan have a long, sad history of persecution against members of minorities. The Government of Pakistan should implement strict legislation to protect the lives and properties of their citizens to prevent minorities from any such future attempts before history dares to take another U-turn. This entry was posted in Asia, Pakistan, Persecution and tagged blog, Christian, Christian persecution, Injustice, minorities, Persecution, Reports, Shekinah. Bookmark the permalink.